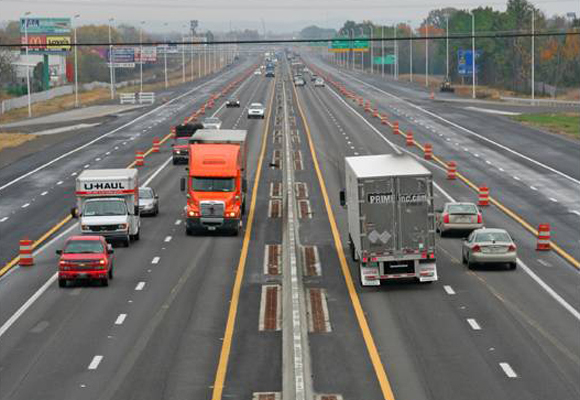 TDOT selected Palmer Engineering to provide survey, structural design, and roadway design services for 4 miles of the widening of I-24, from SR-96 to East of SR-10, from four to eight lanes. Also included in the design is a new Parclo-A Interchange at SR-99, the widening of SR-99 from a 2-lane section to a 5-lane curb and gutter section, interchange modifications at SR-10, and the widening of SR-10. Palmer’s responsibilities included: field surveys; bridge surveys and design; Property and existing ROW; core staking; horizontal and vertical alignments; side road relocations; hydraulic analysis; ROW calculations; public hearings; field reviews; pavement marking plan; traffic control plans; Erosion Prevention and Sediment Control Plans; roadway quantities; stream relocation, mitigation, and permit sketches; and the design of 3 retention ponds.